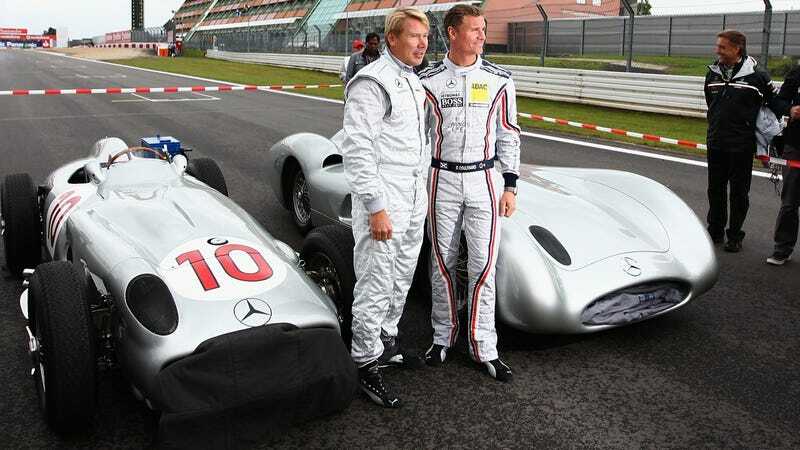 Guess who’s back in Juan Manuel Fangio’s Mercedes W196: it’s 1998–1999 world champion Mika Häkkinen, joined in the W196’s Monza version by former teammate David Coulthard. Sebastian Vettel’s mood was a perfect reflection of the German summer and his performance on track. It’s no Nordschleife, but the Nürburgring’s GP-Strecke is a much better circuit than many on the calendar. This year’s race featured six German drivers. Clockwise, from top left: Adrian Sutil (Force India), Nick Heidfeld (Renault), Timo Glock (Virgin), Nico Rosberg (Mercedes), Sebastian Vettel (Red Bull) and Michael Schumacher (Mercedes). Jarno Trulli gave way to Karun Chandhok in one of the Lotuses, who ran a not too impressive race. Do not touch these when wet. Mark Webber may have pipped Lewis Hamilton to pole, but Hamilton wasted no time in gaining P1 from the dirty side of the grid immediately after the start. Fernando Alonso is on a roll: a win and two second places from the last three races, making him the most successful driver between Valencia and the Nürburgring. Lewis Hamilton on his way to his 16th victory. Echoing Nigel Mansell, who gave a lift to Ayrton Senna after Senna’s McLaren had run out of fuel at the 1991 British Grand Prix, Mark Webber carries Fernando Alonso to the podium ceremony. Fernando Alonso, Lewis Hamilton and Mark Webber are joined on the podium by McLaren’s operations director Simon Roberts. One happy Lewis. His passing was spectacular.